Sharaan, M., et al. First Experience of Rotary Nickel Titanium Root Canal Instrumentation Performed by Undergraduate Students and General Dentists. (2017) J Dent Oral Care 3(2): 1- 6. © 2017 Sharaan, M. This is an Open access article distributed under the terms of Creative Commons Attribution 4.0 International License. Introduction: The purpose of the present study was to evaluate comparatively the efficiency of two rotary Nickel Titanium (NiTi) file systems in instrumentation of simulated curved canals performed by undergraduate dental students and general dentists. Methodology: Twenty undergraduate dental students and 20 dentists participated in this study. After an introductory lecture, two simulated curved root canals in resin blocks with the same size and geometry were prepared by each participant, using the ProTaper Next or iRace file systems. The preparation time was recorded, and each participant received a questionnaire for self-assessment and evaluation of the difficulty of the systems. Blocks were collected, coded, photographed digitally, and evaluated microscopically. The status of the apical foramen of the simulated root canals was classified as intact, blocked or instrumented. The shape of root canal was evaluated further for the presence of zipping or transportation. T-test and Fisher’s exact test were used for statistical analysis of the collected data (p < 0.05). Results: The mean time for instrumentation with the ProTaper Next system by the group of students was significantly greater than that prepared by the group of dentists. The time for instrumentation was significantly greater for the ProTaper Next system than that for the iRace system prepared by the group of students, while no significant difference was seen in the group of dentists between instrumentation with the two rotary systems. In general, no significant differences were observed between the two systems in terms of technical quality of instrumentation. In the group of students, significantly greater number of canals with blocked apical foramen were produced with ProTaper Next than the iRace system, while the number of over-instrumented canals was significantly greater with the iRace system. In the group of dentists, significantly greater number of canals with blocked apical foramen with the iRace than the ProTaper Next system was seen, while the number of over-instrumented canals was significantly greater with the ProTaper Next system. Conclusion: No significant difference in the technical quality of simulated curved canal preparation was detected between the ProTaper Next and iRace rotary Ni-Ti files systems. Although no difference in the occurrence of procedural errors produced by the in experienced students or experienced dentists groups was noticed, the types of procedural er-rors in relation to the used rotary files system were different between the two groups of participants. Among the various factors which influence the outcome of root canal treatment, removal of bacteria, debris and organic tissues through chemo-mechanical preparation has been recognized as the most important one. A variety of instruments and techniques in combination with disinfecting irrigation solutions and endodontic dressings have been proposed for the chemo-mechanical preparation of root canals. The cleaning ability of root canal instruments, as well as their shaping ability[1,3], have attracted attention in research. Over the past decade, rotary nickel titanium root canal instruments have extended the endodontic armamentarium. Endodontic has faced significant evolution over the last few years, especially in the field of root canal preparation. Automated systems have been widely employed by dental professionals and have, more recently, been introduced in practical modules of undergraduate dental programs. ProTaper NiTi (Dentsply Maillefer, Ballaigues, Switzerland) rotary instrument is one of the most admired endodontic Nickel – Titanium ( Ni-Ti) systems currently in the market which represents an invention for shaping root canals. A unique feature of a ProTaper instrument is each one has changing percentage tapers over the length of its cutting blades. A new system, called ProTaper-next has been introduced in 5 files which are made of a different type of metal called the M-wire. Also, changes in the cross–section from triangular to rectangular in shape and an off-set center of rotation. Rotary with Alternating Cutting Edges (RaCe) instrument (FKG Dentaire, La-Chaux –de- Fonds, Switzerland) is one of the systems that has been used for severely curved canals with success due to its extreme flexibility and good shaping ability with little transportation. iRaCe instruments have a triangular cross-sectional design with sharp cutting edges. A new Race system called iRace has been introduced with 3 - 5 files depending on the different types of curvatures. Using NiTi rotary instrumentation by dental students has been examined previously, but studies related to experiences using ProTaper Next or iRace systems by preclinical dental students are negligible in addition to those compared to general practitioners. Our null hypothesis was that there were no differences exist after instrumentation of simulated curved canals between; ProTaper Next and the iRace rotary files systems when they were used by student’s group, ProTaper Next and the iRace rotary files systems when they were used by dentist’s group, student and dentist groups when they used the ProTaper Next file system ,student and dentist group when they used iRace rotary files systems. The purpose of the present study was to evaluate comparatively the efficiency of two rotary Nickel Titanium (NiTi) file systems (ProTaper Next and iRace) in instrumentation of simulated curved canals performed by undergraduate dental students or general dentists. Twenty undergraduate 4th, 5th year students and interns at the Dental School of the Gulf Medical University (GMU), Ajman, UAE (student group), and twenty dentists (dentist group) with practical experience in only manual root canal treatment were asked to perform complete root canal instrumentation of curved simulated canals in plastic blocks, by using two rotary systems ProTaper Next (Dentsply, Maillefer, Ballaigues, Switzerland) and iRace (FKG Dentaire, La –Chaux –de Fonds, Switzerland). Both groups had a basic introduction presentation on rotary instrumentation, rotary files and a detailed teaching on each system’s special features and way of usage. The dental course in GMU is completed over the course of five years. Students included in the student- group had taken a preclinical endodontic course that used Gates Glidden drills and 0.02 taper stainless steel hand-files in a crown-down and stepback preparation technique. Non-specialists dentists included in the dentist-group had a clinical experience in general dentistry from 1 - 3 years. Approval of the Institutional Review Board at European University College was obtained to conduct this research project. A total of 80 simulated curved canals made of resin (Dentsply Maillefer, Ballaigues, Switzerland) were used in this study. All canals were 16 mm long, consisting of a 12 mm long straight coronal part, and a 4 mm long curved apical part. Each of these blocks had a 50 degree curvature according to Schneider method and each apical canal diameter was equivalent to an ISO size #10 and tapering 0.02. Each participant received a set of both Ni-Ti files, K-file # 10, K-file # 15, endodontic ruler, Glyde (Densply De Tray, Konstanz, Germany), water as an irrigating solution and a portable endo-motor which was set differently according to the Ni-Ti rotary beforehand for every student. 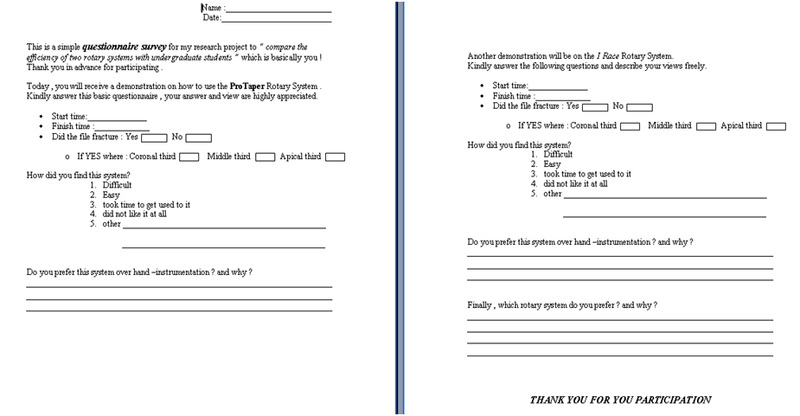 A two-page questionnaire was handed to every participant, containing the same multiple choice and open-ended questions for each system. Participants recorded their names and the corresponding code number of the plastic block, and adjusted the hand stainless steel and rotary files to the working length (16 mm) before starting the preparation. The starting and ending time of each “block instrumentation” were recorded by the participants. 1. File ISO # 10 and #15 to the full working length. 2. After canal irrigation with water, X1, coated with Glyde, was used till full working length with gentle brush strokes. 3. Irrigation with water, recapitulation with file ISO # 10, then X2 used was full working length. Irrigation with water, recapitulation with file ISO #10, then X3 used to full working length. 4. Placement of the Gutta percha master cone ISO 30/0.07 and recording the finishing time in the questionnaire. Reamer with alternating cutting edges instruments were also used in crown-down manner according to the manufacturer’s instructions using a gentle in –and –out motion. Same exact instructions were given as described above and provided below. 2. After canal irrigation with water, R1, coated with Glyde, was used to before the curvature with gentle brush strokes. 3. Irrigation with water, recapitulation with file ISO # 10, then R2, coated with Glyde, used to full working length. Irrigation with water, recapitulation with file ISO #10, then R3, coated with Glyde, used till full working length. 4. Placement of the Gutta percha master cone ISO 30/0.04 and recording the finishing time in the questionnaire. After instrumentation, the basic questionnaire (Figure 1) was answered according to what the participant perceived on the system’s ability for shaping simulated canal in relation to any errors they had done during instrumentation. Finally, all questionnaires, prepared blocks and files were collected. Following collection of the blocks, a digital photograph of each canal with and without the corresponding gutta-percha cone was taken. Figure 1: The questionnaire form used in the present investigation. i. Subjective evaluation of the used rotary systems by the participants was made and results are classified as easy instrumentation, difficult instrumentation, no response. ii. The time, for each canal instrumented, was recorded in minutes. The starting and finishing time was recorded before and after cleaning and shaping. This time recording included irrigation, instrument changes and recapitulation with size 10. All prepared blocks were evaluated by an EUC Endodontic Program faculty member who had no access to the coding number. The technical quality of the instrumentation was assessed under microscope with 16X magnification. Assessments were made with reference to the location of Gutta percha cones in relation to the apical foramen and the presence of 3 types of procedural errors (zipping, transportation and file fracture). Each block was classified into one of the following 6 categories: Intact apical foramen, Blocked apical foramen, Blocked apical foramen with canal transportation, Blocked apical foramen with file fragment, Instrumented apical foramen, Instrumented apical foramen with canal zipping. Statistical analysis of the collected data covered time and microscopic evaluation of canal instrumentation. The parametric t-test for comparison of two independent samples and the Fisher’s exact test were used. The level of significance was set at p < 0.05. Eighty percent of the group of students stated that instrumentation with the ProTaper Next system was easy. All students found instrumentation with the iRace system to be easy. Only forty-five percent of the group of dentists stated that instrumentation with the ProTaper Next system was easy. Eighty percent of the group of dentists stated that instrumentation with the iRace system was easy. The average time taken for instrumentation with ProTaper Next or iRace systems by the groups of stu-dents or dentists can be seen in Table I. The mean time for instrumentation with the ProTaper Next system by the group of students was significantly greater than that prepared by the group of dentists (15.6 ± 4.29 – 9.78 ± 2.99). The mean time for instrumentation was significantly greater for the ProTaper Next system than that for the iRace system prepared by the group of students (15.65 ± 4.29 – 8.57 ± 3.13). No significant difference was seen in the average time taken by the group of dentists between instrumentation with the two rotary systems. Table I: Assessment of mean time in minutes taken for instrumentation with ProTaper Next or iRace systems by the groups of students or dentists. Significant differences could be seen between the two groups for ProTaper Next systema and between the two systems in the students groupb (p < 0.001). No significant difference between instrumentation with ProTaper Next and iRace systems in the Dentists groupc (p = 0.3978). Table II: Assessment of the quality of instrumentation according to the criteria specified in Material & Methods for the two systems. No significant differences can be detected between two rotary systems. Table III: Assessment of the quality of instrumentation by students. Significant differences between the two rotary systems are seen (p < 0.0001). Table 4: Assessment of the quality of instrumentation by dentists. Significant differences between the two rotary systems are seen (p < 0.0001). Since issues related to the success and safety of introduction of these systems are missing from the literature, we designed this investigation to compare the efficiency of experienced and inexperienced clinicians to perform root canal preparation by using two generations of well accepted rotary systems worldwide. No training to rotary Ni-Ti files systems had been declared from any of the participants in the study. From the definition of research problem in this project and in order to meet the objectives of this study, the participation of highly skilled clinicians to root canal preparation had been excluded. Simulated canals were used as our examination specimen to unify all variables like size, canal shape and conicity, curvature and even the material characteristics, although they do not match the surface texture nor the hardness nor the cross-sections of natural teeth. Concerning the validity of experimental studies, Lim and Webber in 1985 concluded that standardized resin blocks were the most reliable in vitro model for evaluation of root canal instrumentation techniques and files systems. Furthermore, resin blocks motivate dental students during learning the new rotary Ni-Ti in-strumentation technique. The most important drawback is the softening of the resin material from the continuous rotation of rotary files, which might be involved in the aetiology of instrument fracture[9,10]. Questionnaires have been proven to be an effective method for investigating educational related issuesS[11-15]. According the questionnaire, only 8% of the students found ProTaper Next easy while iRACE had a 100% easy characterization in the student group. In contrast within the dentist group, 45% and 80% evaluated the ProTaper Next and iRace systems as easy to use respectively. It seems that under the conditions of the present investigation, iIRACE had a higher acceptance of both types of clinicians. However, it must be stated that in all cases preparation with the iRace files system followed after instrumentation of the ProTaper Next files system. The two rotary systems that were conducted in this study had different tapers according to each file system and also a different concept to achieve the final taper. For instance, Pro-Taper Next has the concept of progressively tapering files and starts with a small taper of 0.04, proceeding with a 0.06 with X2 then its largest taper of 0.07 with X3. This system then returns back to a tape of 0.06 with enlarging the file size till X5. Unlike the iRace system, which has a different concept of starting big then decreasing to small taper to facilitate the entry of the other files. So R1 has the biggest taper of 0.06 then the rest of the files have a 0.04 taper. Our null hypothesis was partly rejected, as we found that there was a difference after instrumentation of simulated curved canals performed with the ProTaper Next file system between the students and dentists group. Otherwise, there were no differences when; ProTaper Next and the iRace rotary files systems were used by students’ group, ProTa-per Next and the iRace rotary files systems were used by dentists’ group and students and dentists groups used iRace rotary files systems. Τhe technical quality of the prepared canals by the two groups of participants and the two rotary Ni-Ti files systems was further compared. In general, there was no significant difference between the two rotary systems when assessing the preparation by all participants as one group. This observation is in agreement with the results published by Saber et al., 2014, where these two systems respected well the original canal curvature of instrumented ex-vivo man-dibular molars in mesio-buccal canals having angles of curvature ranging from 25° to 35°. Having a closer look at the quality of instrumentation in each group separately, we noticed in the student group that blocked apical third was significantly more by ProTaper Next than with iRACE, while over-instrumentation of canals was much more with the iRACE system. The opposite results were achieved with the group of dentists, which had more blocked apical foramen with the IRACE system and over-instrumented apical foramen with the ProTaper Next. In addition, no separated in-struments with both systems were found in the students group, while one separated instrument with the ProTaper Next system and four fractured files in the iRACE system were detected in the group of dentists. Our finding was similar to that of Baumann and Roth 1999 who concluded that students lacking endodontic experience and experienced dentists both successfully used rotary NiTi files and achieved a good root canal geometry. In conclusion, it was found that no major difference in the technical quality of simulated curved canal preparation was seen between the two rotary Ni-Ti files systems used in the present investigation. No difference in the occurrence of procedural errors produced by the students or dentists groups was noticed. However, the types of procedural errors in relation to the used system were different between the two groups of participants. It seems that Prosper Next and iRace files systems do not need any previous endodontic clinical experience before introducing them in an undergraduate endodontic training program. Although the two tested rotary files systems can be used safely for instrumentation of curved canals by both experienced and inexperienced clinicians, separate and group-specific guidelines and manufacturer’s instructions are absolutely necessary for both groups. Georgelin-Gurgel et al., (2008), explained the importance that the undergraduate students should gain knowledge and skills in using rotary instrumentation by receiving specific pre-clinical training in order to avoid iatrogenic accidents. In accordance to previous studies, we recommend that Ni-Ti rotary instruments should be included in the undergraduate dental curriculum[18-20]. 1. Schäfer, E., Vlassis, M. Comparative investigation of two rotary nickel titanium Instruments: ProTaper versus Race. Part 2. Cleaning effectiveness and shaping ability in severely curved root canals of extracted teeth. (2004) Int. Endod J 37(4): 239-248. 2. Gekelman, D., Ramamurthy, R. Mirfarsi, S., et al. Rotary nickel-titanium GT and ProTaper Files for root canal shaping by novice operators: a radiographic and micro-computed tomography evaluation. (2009) J Endod 35(11): 1584 -1588. 3. Guelzow, A., Stamm, O., Martus, P.,et al. Comparative study of six rotary nickel-titanium systems and hand instrumentation for root canal preparation. (2005) Int. Endod J 38(10): 743-752. 4. Hülsmann,M., Rümmelin ,C., Schäfers, F. Root Canal cleanliness after preparation with different endodontic handpieces and hand instruments: a comparative SEM investigation. (1997) J Endod 23(5): 301-306. 5. Kuzekanani , M., Walsh, L.K. , Yousefi, M.A. Cleaning and shaping curved root canals: Mtwo vs. ProTaper instruments, a lab comparison. (2009) Indian J. Dent Res20 (3): 268-270. 6. Lim, K.C., Webber, J. The validity of simulated root canals for the investigation of the prepared root canal shape. (1985) Int Endod J 18(4): 240-246. 7. Tu ,M.G., Huang, H.l., Hsu ,J.T. et al. Experiences of undergraduates using the Ni-Ti rotary technique at the beginning of the endodontic curriculum. (2008) J Denl Sci 3(4): 199-203. 8. Kum, K.Y., Spangberg, L., Cha, B.Y., et al. Shaping ability of three ProFile rotary instrumentation techniques in simulated resin root canals. (2000) J Endod 26(12): 719- 723. 9. Thomson, S.A., Dummer, P.M. Shaping ability of ProFile .04 taper series 29 rotary nickel-titanium instruments in simulated root carats Part 2. (1997) Int Endod J 30(1): 8-15. 10. Baumann, M.A., Roth, A. Effect of experience on quality of root canal preparation with rotary nickel-titanium files (1999) Oral Surg Oral Med Oral Pathol Oral Radiol Endod 88(6): 714-718. 11. Sofola, O.O., Jeboda, S.O. Perceived sources of stress in Nigerian dental students. (2006) Euro J Dent Educ 10(1): 20-23. 12. Rolland, S., Hobson, R.., Hanwell, S. Clinical competency exercises: some student perceptions. (2007) Eur J Dent Educ 11(3): 184-191. 13. Arbab-Chirani, R., Vulcain, J.M. Undergraduate teaching and clinical use of rotary nickel-titanium endodontic instruments: a survey of French dental schools. (2004) Int Endod J 37(5): 320-324. 14. Machado-Carvalhais, HP., Ramos –Jorge, ML., Auad ,SM., et al. Occupational exposure to potentially infectious biological material in a dental teaching environment. (2008) J Dent Educ 72(10): 1201-1208. 15. Sonntag, D., Bärwald, R., Hülsmann, M., et al. Pre-clinical Endodontics: a survey amongst German dental schools. (2008) Int Endod J 41(10): 863-868. 16. Georgelin-Gurgel, M., Devillard, R., Lauret , M.E., et al. Root canal shaping using rotary nickel-titanium files in preclinical teaching. (2008) Odon stomatol Trop 31(121): 5-11. 17. Saber , SE., Nagy, M.M ., Schäfer, E .Comparative evaluation of the shaping ability of Pro Taper Next, iRace and Hyflex CM rotary Ni Ti files in severly curved root canals. (2015) Int Endod J 48(2): 131-136. 18. Martins, R.C., Seijo, M.O., Ferreira, E.F., et al. Dental students' perceptions about the endodontic treatments performed using Ni Ti rotary instruments and hand stainless steel files. (2012) Braz Dent J 23(6): 729-736. 19. Kwak , SW., Cheung, G.S., Ha, J.H., et al. Preference of undergraduate students after first experience on nickel-titanium endodontic instruments. (2016) Restor Dent Endod 41(3): 176–81. 20. Karova, E., Dogandzhiyska ,V. Undergraduate Teaching for Using Rotary Nickel-titanium Endodontic Instruments (2016) Int J Dent Sci Res 6: 95-99.